One of my favorite set of ramen shops just opened up a fourth shop in Higashi Umeda. Jinrui Mina Menrui, Seka Ichi Himana Ramenya and Kuso Oyaji Saigo no Hitofuri all focus on dark shoyu ramen, and SUPER MEN is no exception. In addition, they have a set of fridges with various beer from around the world. Their two dishes were usukuchi, or light soba, and koikuchi, or rich soba, and since the usukuchi was not available yet, I got the koikuchi. This bowl wasn't quite as dark as the other shops, but the shoyu was distinctly sharp; easy to drink with a bit of fish and sweetness at the end of each sip. The noodles were medium, and were the perfect level of firmness to make each bite into them satisfying. 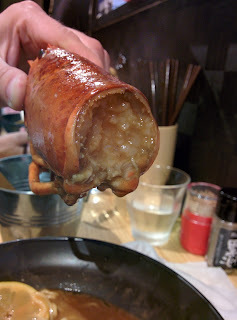 There were long slices of chashu that tasted more like roast beef than pork; a trend I've seen at other shops. This was a solid shoyu that offered just a couple nice deviations from the standard. I would like to, but it is gone now. It's closed, so you can't. Another visit Kyoto means I can continue exploring the Shijo area for ramen. Last time I was deciding between a couple ramen shops, but I ended up only being able to find one of them. This time I was determined, and finally discovered where Wajo Ryomen Sugari is. They have ramen and curry tsukemen, but the main dish is the motsu tsukemen, so I ordered that. The bowl was full of "motsu" innards, but the soup itself was a pretty standard gyokai tonkotsu. It was salty and tingly with umami, but it didn't stand out terribly from other good soups. 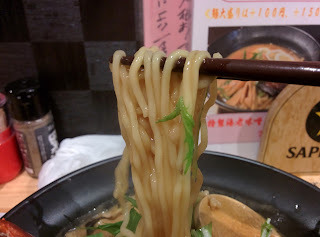 The noodles did, however, and they were strong with their own flavor, grainy in a way that soba often is. The grilled onions and motsu mixed in had a nice charred, smoky flavor, and the pork melted in my mouth. I'm often too lazy to travel too far out of Osaka city for ramen, but a new shop opened in Toyonaka that I couldn't ignore. 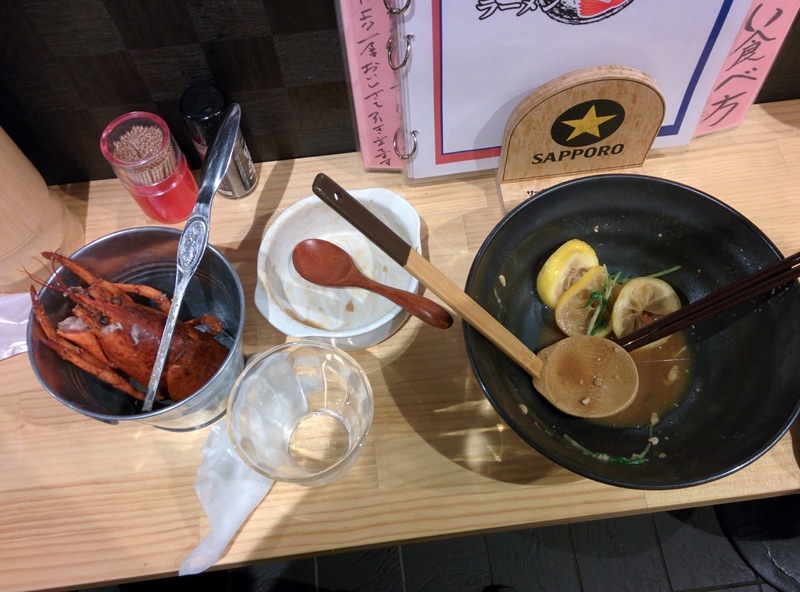 I met up with Philoramen and we visited Ebi Miso Ramen Kaiho together. 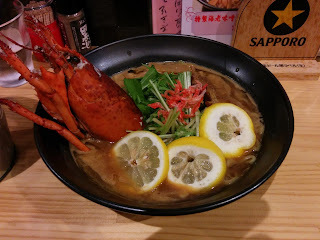 "Ebi" means shrimp, and that is a hint to the shop's main dish: lobster miso ramen. This was quite the bowl. The broth was a thick, salty glaze; drinking it was like drinking a shrimp cracker. The noodles kept the soup in check, allowing a more balanced mix of wheat, onions, and shrimp flavors. I appreciated how much the flavor changed as the bowl went on, too. The lemons lightened up the bowl towards the end, and picking out meat from the lobster was a fun way to take breaks from the soup. In the end they offered cheese risotto to be mixed in with the dregs of the ramen. It was a different meal: the bulky shrimp ramen mixed with the charred melty cheese. Taiwan Maze Soba shops have been popping up all around Osaka. The style introduced in Nagoya has finally made its way to Kansai. Tsubaki has brought it to Kitashinchi, though at time of writing they have moved to Nipponbashi. As with specialized shops like this, I ordered the one main menu item, the Taiwan maze soba. The egg on top of the mixture bonded with the already substantial curly noodles to form thick, chewy, glazes ropes. There was actual spice in the bowl, and the garlic gave the bowl bite, too. 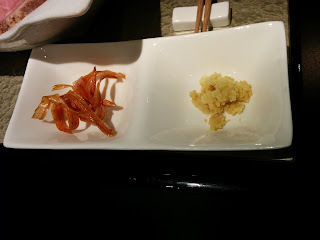 It was a bit salty, which made it a bit tougher to eat as it went on, but Tsubaki provided a kelp vinegar that balanced out the salt and sweetened up the meal. You should definitely try one of these Taiwan maze soba shops, and Tsubaki is a good one.